Delicately peppery. Peckish to plate in less than 25 mins. High in protein and fibre. Low saturated fat.These peppery Puy Lentils were grown Le Puy-en-Velay, France. Tastier than your average lentil, Puy Lentils keep their shape well and carry accompanying flavours brilliantly. They cook in just 20 minutes and are a great protein-packed alternative to meat, rice or potatoes. Easy to prepare No need to pre-soak. Rinse and drain the lentils. Then put them in a saucepan and cover with 3x their volume of water (try using veggie stock and some white wine for extra flavour). Bring to the boil and simmer for 20-25 mins, until the lentils are firm to the bite. Drain and serve. Get creative For a healthy dinner: brown a couple of lamb shanks in a pan, and stew together with some cooked Puy Lentils and seasonal green veg. 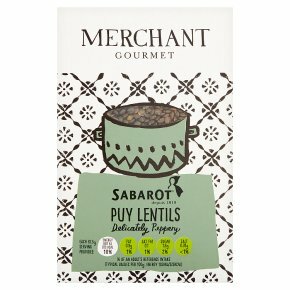 These lentils are also a fantastic base for quick, wholesome salads (hot or cold) and are delicious in tomatoey stews and cassoulets. Caution: Do not eat raw lentils. No need to pre-soak. Rinse the lentils under running water then drain. Put the lentils in a saucepan and cover with 3 times their volume of water (try using vegetable stock, or half wine for extra flavour). Bring to the boil, then simmer for 20-25 minutes until the lentils are firm to the bite. Drain and serve.